Tente Lodge 4 pers. 2 bdrms. Wake up your adventurous side in this tent for 4 persons! Do you like traditional camping but you can't separate yourself from your everyday comfort? This tent lodge with terrace Camping 5 stars Sunelia alum vacation is a good compromise for YOU. This type of shelter is halfway between the campsite and the Mobil-home. It is a perfect accommodation solution for a couple with two children or a group of friends made up of four people. Although it is called "tent", it is a high-end accommodation that has everything you need so that its residents can spend a pleasant, comfortable and serene stay. What does the Lodge 4 people tent include? As already said, this accommodation has the appearance of a tent but the same equipment as the Mobil-homes. It is equipped with a bedroom with a double bed and another room with two single beds. A living area allows the small family or group of friends to spend intimate but friendly moments. They can share their days and everything they have DONE. They can also plan together the suites of their stay. In the equipped kitchenette, you can prepare food for EVERYONE. Household appliances but also various kitchen equipment such as kitchen utensils or batch of dishes to eat are available. It has, for example, a refrigerator, a microwave and a cooking appliance. But as the lodge tent is a shelter made to awaken the adventurous side of everyone, it is without sanitary and without water. We must therefore join the public health facilities and the drinking water supply terminals. This accommodation fits perfectly in Nature. It is located in the WOODS. It has a large covered terrace. This space connects the inside of the Outside. You can relax there to enjoy the sweetness of the air coming from the WOODS. 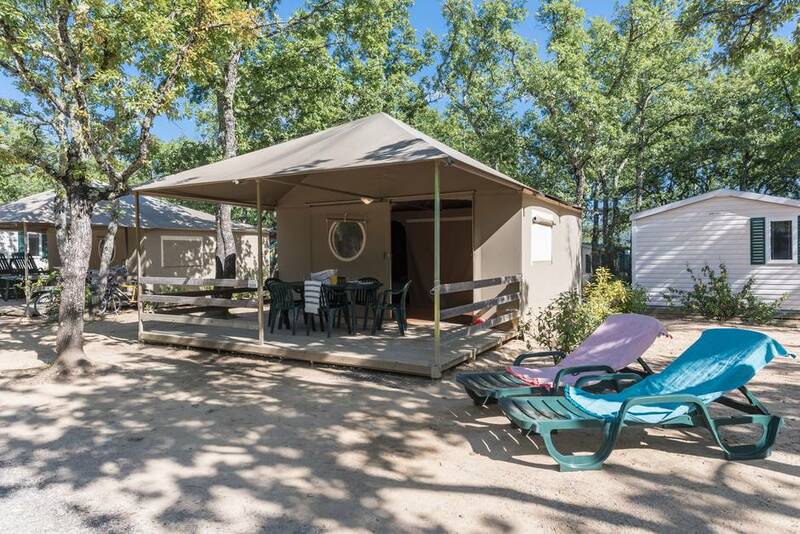 If you opt for this lodge tent, you can rent sheets and towels. You can also make a housekeeping reservation of end Stay. We also have the right to bring pets (excluding First and second category dogs). For this, a surcharge of 6 €/day is also requested. In addition, you can have access to all the facilities and services of the Campsite. Amateurs and swimming professionals can indulge in various games in the water Park. If you like outdoor sports, you just have to choose one of the grounds available on the site of this outdoor hotel. In case you really need a complete relaxation session, you can make a reservation with the relaxation, Wellness and spa Area. If you don't want to cook in the lodge tent, you can order various dishes at the Restaurant. You can eat on the spot or take them away. Whether it's for hot drinks or for fresh drinks, we just have to go to the bar. For shopping, the grocery store can provide quick and efficient solutions.